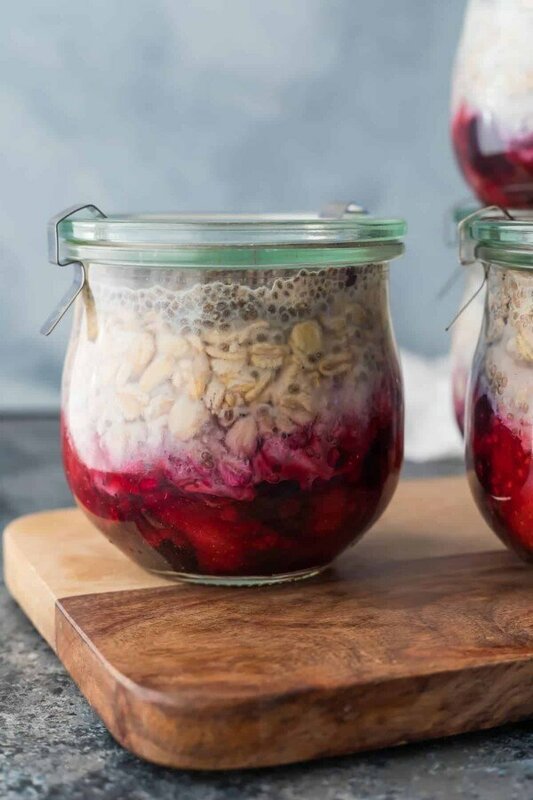 Fruit on the bottom overnight oats are an easy, 5-ingredient and 10-minute prep recipe to get breakfast in the fridge for four days. Nice and thick, with plenty of fruit and a boost of protein from chia seeds. I’m way late to the overnight oats game. Truth is, I’ve tried them a few times and couldn’t quite get on board with the resulting texture. They were weird and watery and just not great to eat. Turns out, I just needed to give them one more try, and add the missing ingredient: chia seeds. 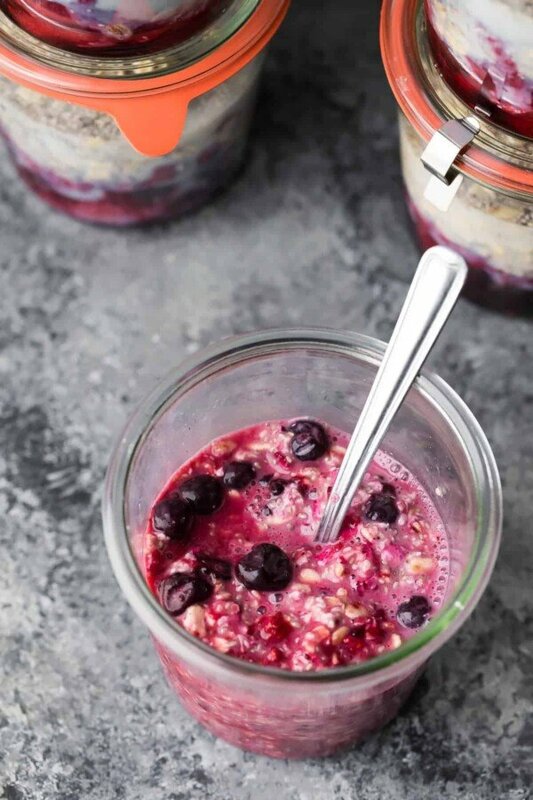 These fruit on the bottom overnight oats ended up perfectly thickened, and with just enough sweetness from the fruit and maple syrup. And my favorite thing ever is that this recipe is so so so much easier than previous recipes I’ve made, with only 5 ingredients and ten minutes required to prep four portions! 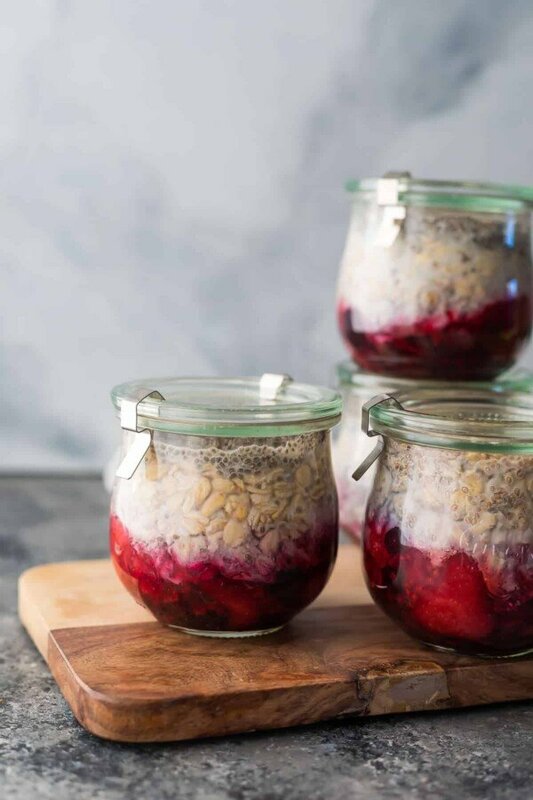 Not only are overnight oats ridiculously easy to prep, and super easy to customize with different spices and extracts, but I love the fact that I can grab them right out of the fridge and eat them as is. they are ready in under 10 minutes and require no bowl! Make them right in your serving jars! I made these ‘fruit on the bottom’ like those fun yogurt cups I enjoyed as a kid. There’s something fun about digging to the bottom of your jar to get the yummy fruit puree and mixing it all up. I hope you all enjoy these overnight oats as much as I have! Looking for more meal prep breakfast ideas? 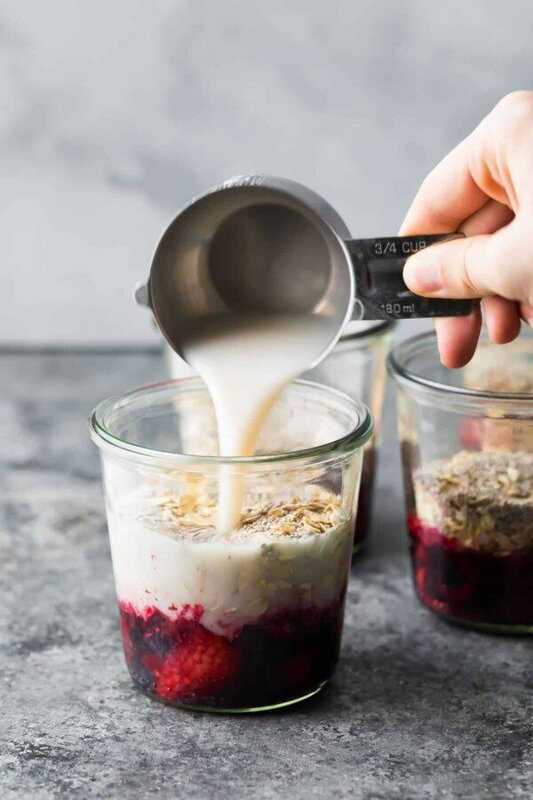 Check out these 7 Healthy Steel Cut Oats Recipes, these Overnight Steel Cut Oats, these Healthy Breakfast Burritos with Kale & Feta, or this round-up with 28 Healthy Breakfast Meal Prep Ideas. You may also like this Chocolate Chia Pudding! Watch the video below to see exactly how I prepped my Fruit on the Bottom Overnight Oats. It’s so easy! You can find more of my recipe videos on my YouTube channel, or on Facebook. Place thawed frozen fruit in the bottom of a jar (at least 12.5 oz; 1 pint works too). Mash with a spatula until pureed. Add in the following order: maple syrup, rolled oats, chia seeds, and almond milk. No need to stir, just put the lid on and place in the fridge overnight. Store for up to 4 days. Enjoy cold. Just made this, and it was amazing! I am always rushing to work in the morning and I just grabbed it out of my fridge to take with me! Thank you for sharing this, I think this will be my new go-to breakfast! I’m so happy to hear it was a hit! Thanks for taking the time to leave a review, Rachel! Are these ingredients for each jar or all jars? Ingredients listed are for 1 portion! where are these jars from? thanks! I’ve made this recipe many time now. I love how easy, healthy and delicious it is. I only made one change and that is that I use fresh fruit. So far my favorite combo is raspberries and blackberries. Thanks for a great recipe, I’m so glad I tried it. I’m so happy you like it, Jill! I will have to try with raspberries & blackberries 🙂 Thanks so much for taking the time to leave a review! I would like to use fresh fruit too. Did you also mash the fresh fruit? You could absolutely use fresh fruit, and just mash it up. Enjoy! Can these be heated up? Thanks for this awesome recipe! I normally have overnight oats daily but this was next level and so simple. So happy you enjoyed it, Jessica! Will it work the same with quick cooking steel cut oats? Good question! I am actually just experimenting with overnight steel cut oats and they are very different than rolled oats, much chewier. 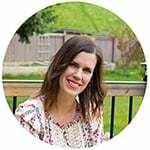 I have only tried the regular steel cut oats but now I want to try instant ones! I did 1/4 cup SCO + 3/4 cup almond milk and it was too much liquid so I’d go down to 1/2 cup. Hope this helps, and I will be posting the recipe on the site soon! Thanks so much for the reply! I didn’t know instant SCO existed till I saw them at Costco. So, yeah, I have lots to use up! I will try it tonight with the reduced liquid. Thanks, again! Update on this: I tried some instant SCO as overnight oats and they were pretty terrible. Super mushy…so I don’t think they are a good option for overnight oats. Does the fruit have to be thawed or can we just put in frozen fruit? You don’t have to thaw it, but if you want to mash it up like the fruit on the bottom cups, it makes it easier when it has been frozen and then thawed. But it will still taste great with frozen fruit. Does this recipe make more than one jar? 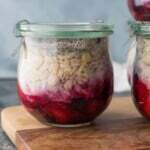 I don’t know why, but in reading all the recipes for overnight oats, it never occurred to me that I should eat them cold! I read that and then immediately got up and prepared a batch to try. I love them! I’ve had them every morning for breakfast for the last three days. Thanks for the recipe!